[INFOGRAPHIC] What are the World’s Most Dangerous Spiders? What Are The Best Tactical Gloves In The Market Today? Is An Entrenching Tool Part of Your Survival Gear? What Is The Best Multitool For Everyday Carry? What Are The Best Entrenching Tools For Backpacking And Survival? Home Authors Posts by Alexa R.
Alexa is an outdoor enthusiast with years of experience camping, hiking, backpacking, and prepping for any situation. You can often find her out in the woods, or getting ready for her next challenge! Tarps vs Tents: Which One Should You Use? 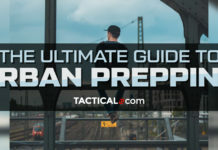 Tactical.com is your best source for tactical information on gear, camping, hiking, hunting, DIY, food, and more. © 2018 Tactical.com, A Terran, LLC website.